A view of the interior(with the choir in procession). In the shadows of the huge complexes of Columbia University and Columbia Teachers College stands a modest structure. 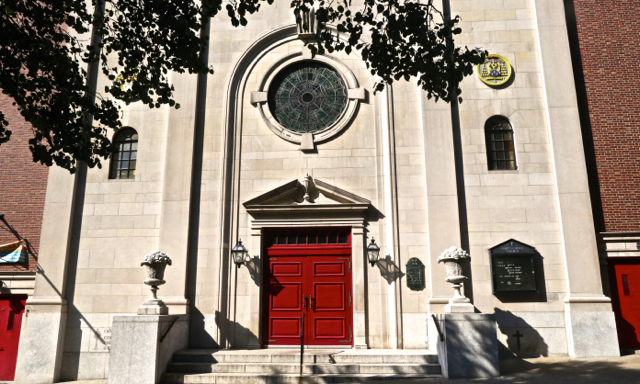 At first one thinks the white stone facade set against a red brick exterior is a copy of an 18th century meetinghouse – transplanted from Boston to Morningside Heights. But a closer inspection reveals the cleverness of the architect. For the stone facade is simply attached to a small, modern high-rise – a miniature skyscraper! Inside the meetinghouse theme continues. The church is small – really a large chapel. The plain white of the columns walls and ceiling, the galleries, the black and white floor and the crystal chandeliers evoke the look of 18th century America. 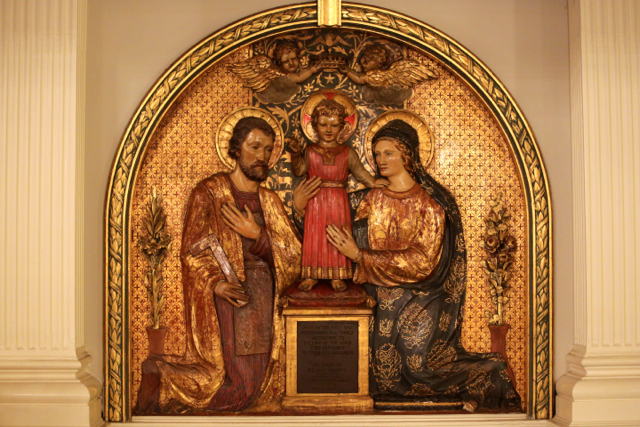 But in the sanctuary, in the side chapel and at other strategic points of the church gleams the gold of Catholic art – 14th century Italy, Siena and Fra Angelico are the inspirations here. 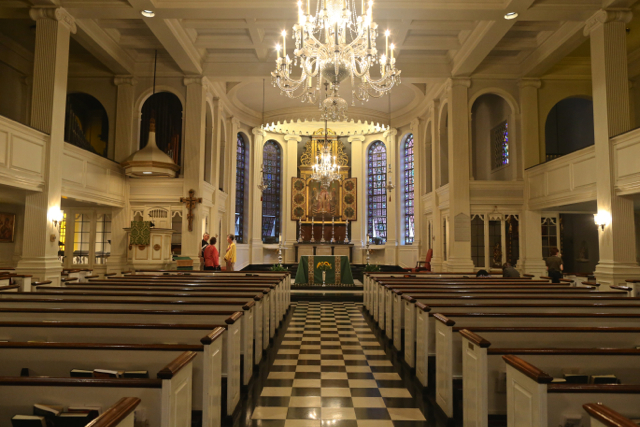 And this marriage or tension – between the Catholic and the Calvinist, between trecento/early quattrocento Florence and colonial New England did not arise by chance, but is the decorative scheme original to the construction of this church. Yet one soon realizes that this very elegant space is really a rectangular auditorium to which a semicircular apse and galleries have been appended. As in the case of the entire parish building itself, the architect has once again cleverly disguised modernity. Now the architect was Wilfred E. Anthony, whose grand church of St Catherine of Sienna (1931) is both the last great Catholic church built on Manhattan Island and the first serious attempt of the Catholic Church there to “engage” architectural modernity. Corpus Christi church of 1936 is a much more conventional exercise. 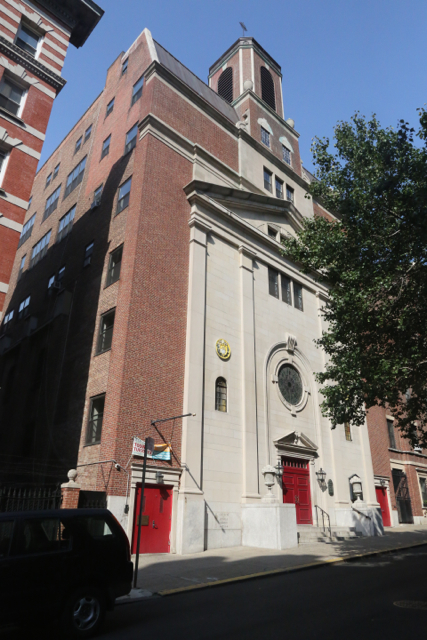 It is one of the last examples of that strange genre of Manhattan parish where church, rectory, convent and school are consolidated in one space-and–money saving structure. 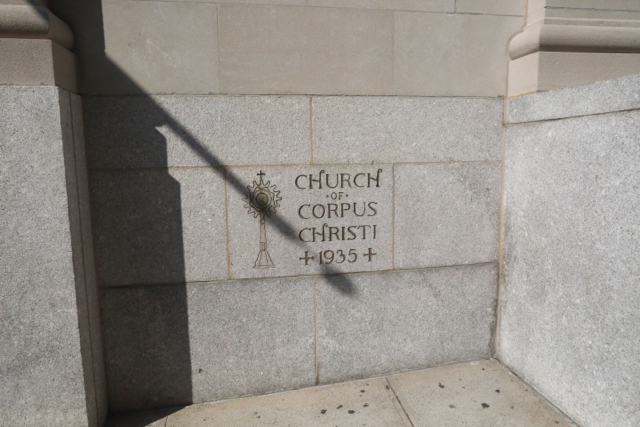 This was already the format of the first building for Corpus Christi parish (the parish opened in 1907). 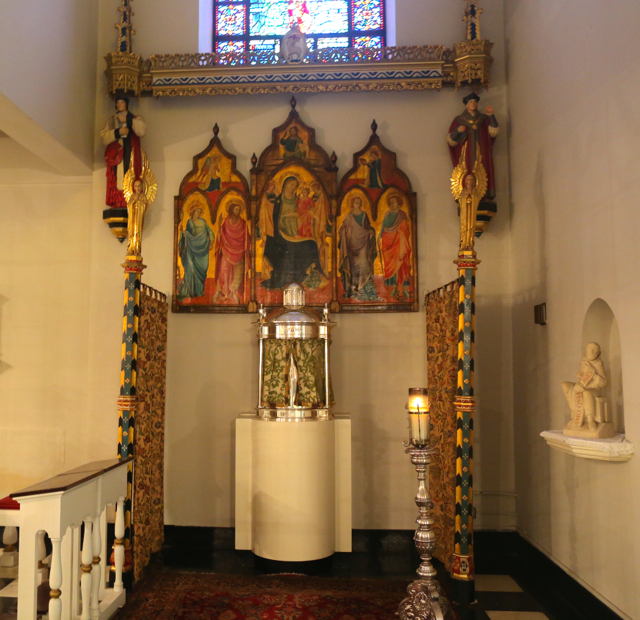 Other examples include, in Hell’s Kitchen, St. Clemens Mary (now Baptist) and St. Ambrose (now Centro Maria) and, in Yorkville, St. Stephen of Hungary (still active). But, while only the Hungarian community and its immediate Yorkville neighbors know of he latter church, Corpus Christi, which resembles it architecturally in a number of respects, has enjoyed a truly extraordinary amount of publicity over the years. 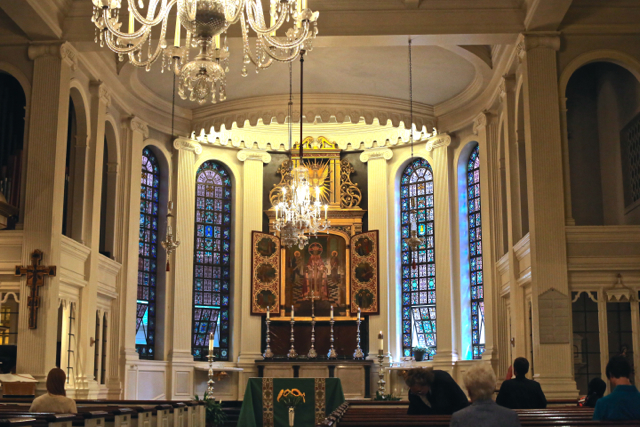 In this perspective, Corpus Christi, like the parishes of the new St. Agnes or Holy Family, possesses one of the most “ideological” architectural programs of any Catholic parish in New York City. I have not read the memoirs of Father Ford, but it appears to me unlikely that the modest sanctuary of Corpus Christi was intended to bear this much intellectual baggage. 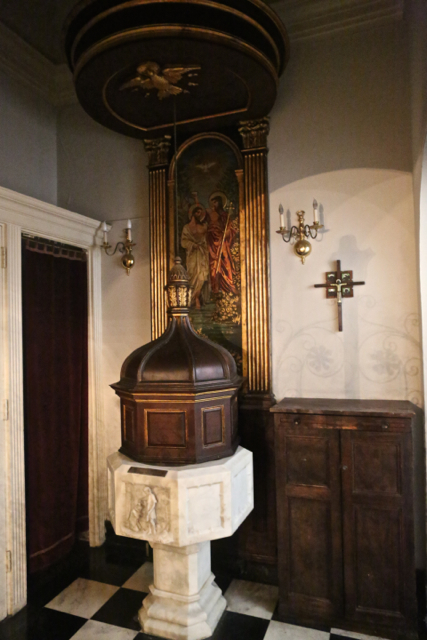 The baptismal font comes from the first Corpus Christi church. Future Cardinal Terence Cooke was baptized here. The sanctuary today. 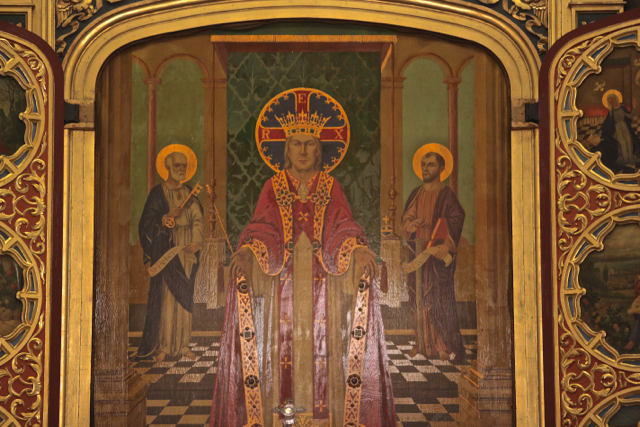 The reredos is original to the construction of the current church. Simone Weil is reported to have prayed here; George Carlin attended the school (proceeding from the sublime to the ridiculous). 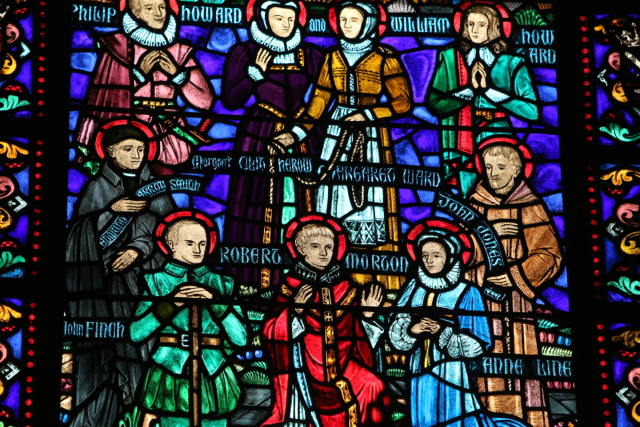 The “too Catholic” window of the English Martyrs. But the unique musical heritage of Corpus Christi is even more closely associated with Msgr. Myles M. Bourke, Pastor of Corpus Christi 1966-1992. He combined ”advanced” ideas in theology and biblical studies with a refusal to totally succumb to the liturgical madness sweeping the church. He did this, however, not by retaining and restoring Tradition – that would be reserved to a later generation- but by crafting his own English liturgy accompanied by music of the Catholic tradition (chant, polyphony and largely “pre-conciliar” Catholic hymns). 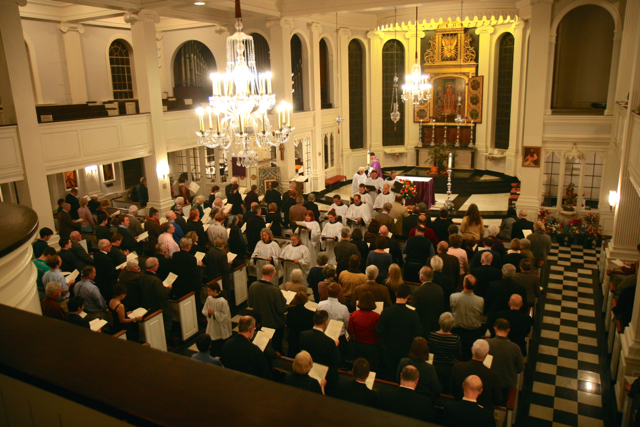 Corpus Christi benefitted musically – then and now – by having a separately endowed professional choir. To attend the “high mass” at Corpus Christi, as I did some weeks ago, is to step backwards in time to the era of Msgr. Bourke: the same 1966 hymn books, the same kind of music (contemporary sacred, polyphony) very competently performed by the professional choir. Certainly the quality and orthodoxy of the sermon appeared miraculous to me compared to my own experiences of “campus ministry” in the 1970’s. It is a remarkable level of achievement in word and music, still by far exceeding that of most parishes in the Archdiocese; that deserves our respect. 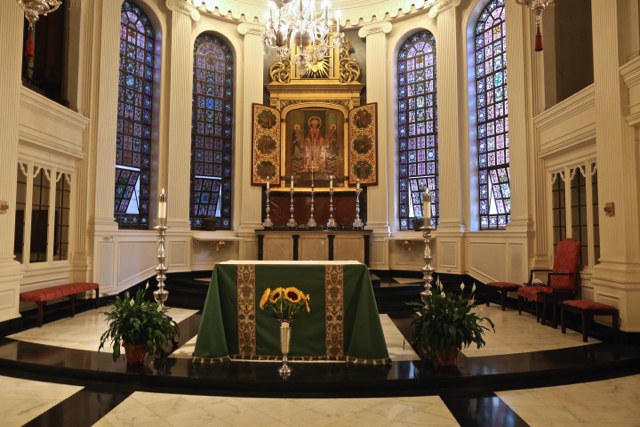 But obviously, at the present day, a number of other churches in the New York area equal or exceed Corpus Christi liturgically: in preaching, in the music and above all in the ceremonial of the Mass. And this competition no longer seeks to create its own “traditions” or idiosyncratic style but aims at an ever deeper immersion in and understanding of the ageless Tradition of the Church. 1)	Merton, Thomas; The Seven Storey Mountain, 207 (Harcourt, Brace and Company, New York, 1948). We admit that, on closer review, this passage is not totally coherent.